Thailand has an extensive railway network, reaching to the furthest extremities of the kingdom, and to the borders of Burma, Laos, Cambodia and Malaysia. The track is narrow (1 meter gauge) as in Malaysia and parts of India, and for most of its length, single-track only; this, together with the lack of bridges, makes travel by train in Thailand rather slow - it can take more than an hour just to get through the various road intersections and out of Bangkok! However, Thailand's railways are relatively comfortable and inexpensive, safer than travel by road, cheaper and more relaxed than travel by air. Using the rail network, you can travel pleasantly and economically from Chiang Mai in the north to Had Yai near the border with Malaysia, from the Laos border at Ubon Ratchathani and Nong Khai, via Bangkok, to Kanchanaburi and the Kwai Valley, for centuries the road to Burma. ThailandByTrain.com started as a rail guide to Thailand - I love Thailand and generally enjoy travelling by train; there are, however, lots of places in Thailand which are inaccessible by rail, and for those places I give appropriate directions. Any information on train time-tables, fares, travel classes etc. cannot be guaranteed, but is, as far as possible, accurate and up-to-date. The Thai railway system connects with Malaysian Railways at two points on the southern border: Padang Besar and Sungai Kholok. 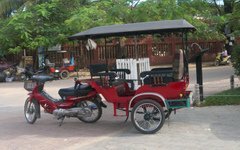 Unfortunately separatist unrest in the South East of Thailand has somewhat affected tourism in that area, especially on the Sungai Kholok side - see the page on Border Travel. An old SRT (State Railway of Thailand) map, which can be seen outside certain stations, shows a connection with the Cambodian Railway at Aranya Prathet (end of the Eastern Line). Unfortunately, after many years of war in Cambodia, the connection was disrupted for many years. Earlier this year (2018) some train services resumed between Battambang and the Thai border, though not across it yet. Hopefully the cross-border link and the link between Battambang and the Cambodian capital will be completed later this year. There is now a rail link to Laos, at Nong Khai. As yet the link only crosses the Mekhong river, but could reach Vientiane in the not too distant future and eventually link up with the Chinese railway system. The Northern Line runs through the heartland of Thailand taking in the ancient capital Ayutthaya, and Chiang Mai, once capital of the Northern kingdom of Lan Na, and other historic centers such as Lopburi, and Lamphun. 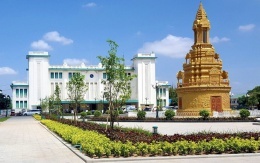 The North Eastern Line crosses the Isan plateau via Khon Kaen and Udon Thani to Nong Khai on the border with Laos, about 20 km from the Laos capital of Vientiane; an easterly spur passes through Nakhon Ratchasima (Korat), Buri Ram, Surin and Sri Sakhet, on the way to Ubon Ratchathani and the border with southern Laos. The Eastern Line goes through Chachoengsao, Prachinburi and Kabinburi to Aranya Prathet on the border with Cambodia. A South Eastern spur of this line goes to Pattaya and Sattahip, but trains are rare. The Southern Line leads to the tropical beaches and islands of the south, and connects with the Malaysian railway system at Padang Besar and Sungai Kholok; from Padang Besar you can travel the entire length of the Malaysian Peninsula arriving at last at the island city of Singapore with its unique blend of east and west. 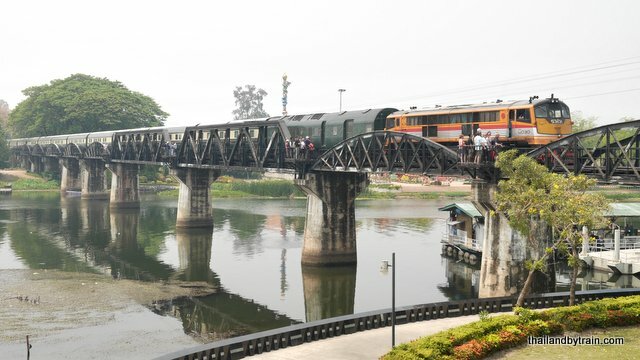 A Western spur of the Southern Line, once known infamously as the Death Railway, runs from Thonburi railway station to Kanchanaburi and the Bridge on the River Kwai. Alongside the main routes the Thai Railway system has several curious branch lines - I particularly like the Mae Khlong-Mahachai line from Bangkok to the coast. 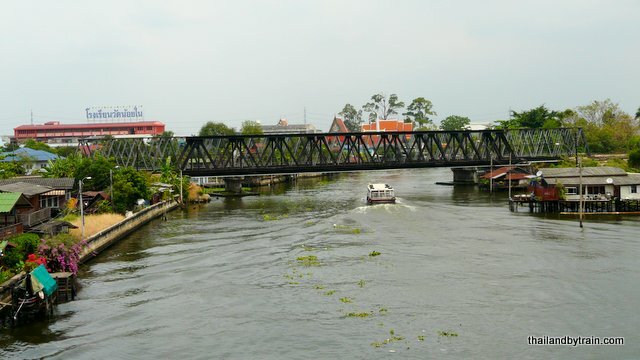 This line originates in Thonburi, west Bangkok, and with no connection to the main network, goes south west to the old fishing ports of Samut Sakhon and Samut Songkhram, with a break in the line at the Tha Chin river in Samut Sakhon - if you want to travel the rest of the line you have to take a two baht ferry and catch another train on the other side. I have tried this trip (see the Mahachai Railway section), but if you try it yourself, check on the train times, because there are not many trains west of the Tha Chin river. One byway which I have not tried, but will do some day, is the train from Bangkok to the old town of Suphanburi, which branches off the main Southern line near Nakhon Pathom. Unfortunately there is only one train per day, leaving Bangkok at 16.40, arriving Suphanburi at 19.40. This is somewhat more convenient than the return train, which leaves Suphanburi at 04.50. Many years ago I noticed that the Thai Railway system connects with the Malaysian railway system and it occurred to me then that the journey from Bangkok, through peninsular Malaysia to Singapore must be one of the great railway journeys of the world. I was not alone in this vision: if you have around $2,050 (2008 price) to spare (per person, one way), you might consider travelling from Bangkok to Singapore in the 19th Century splendour of the Eastern and Oriental Express. If your budget like mine is more limited, then travel by scheduled services, though much less luxurious, is still a lot of fun. Up and down the Thai Railway Network, are relics of the past. I photographed the strange vehicle below some time ago, but was unable to find anything about it. 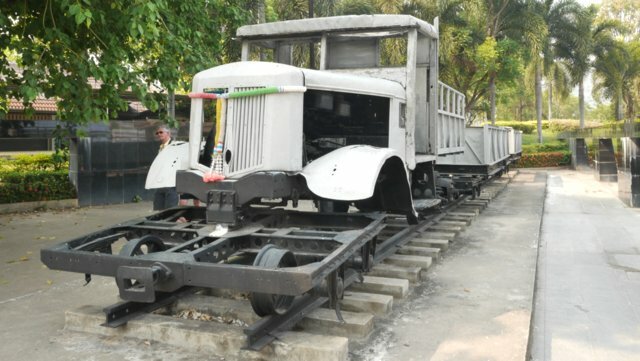 It appears to be a WWII era diesel truck fitted on a bogie to allow it to use the railway system. Since I wrote the above, I have read Jorges Orgibet's hilarious account of his adventures in post WWII Thailand, in particular the section where, due to a lack of rolling stock, they cobbled together a "special train" from an old Japanese ten-wheeler diesel truck, its front wheels replaced by a four-wheel railway bogie. It does not look like the one below, so there may have been more than one around. See the history section for more images. Comments and suggestions to webmaster@thailandbytrain.com. Traditionally, sugar in Thailand was often produced in an unrefined state from coconut palm sap or sugar cane juice. Around Samut Songkhram, a major fruit growing area South West of Bangkok it is still possible to witness the process. Did you ever hear the story of the man who attempted to change a light bulb and ended up having to pay for a new ceiling? An overnight trip from Bangkok to Krasang (Buriram district) on the old rolling stock - not the most comfortable. 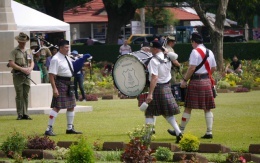 Hellfire Pass with slideshow, Wang Pho Viaduct with slideshow; Anzac Day at Kanchanburi War Cemetery, on 25 April every year. Cambodia's railways took heavy damage during the Indo China Wars but recent attempts to revive the system have led to the resumption of services to the South but not to the Thai border: on this section the only railway running is the "Bamboo Railway"